The Slieve Gullion Complex represents the ‘root’ zone of a now deeply eroded volcanic caldera  that intruded the southwest end of the Caledonian Newry Igneous Complex (P947865) at about 58–56Ma . The highest point, Slieve Gullion (573 m), lies at the centre of an 11 km diameter, circular igneous complex intruded into a circular ring fault (P948036). The Complex consists of three distinct units (P947870) with the earliest intrusion of silicic magma forming an almost complete ring that was associated with high level explosive activity. In the centre of the complex, and forming Slieve Gullion, a later, sheeted complex consists of flat-lying silicic and basic layers. The final intrusive phase is a granite stock that is confined to the southeast part of the complex. The Slieve Gullion Ring Dyke marks the outer edge of the intrusive complex and forms a circle of hills up to 300 m high (P948037) composed mainly of porphyritic felsite and porphyritic granophyre . 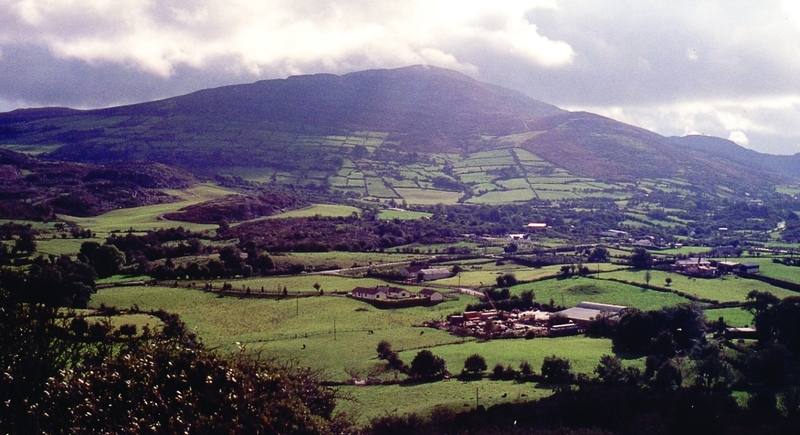 The ring dyke encloses two generations of earlier formed gabbro/dolerite intrusions and olivine basalt, trachyte and tuffs which were the earliest eruptive products of the Slieve Gullion ‘volcano’. Evidence of subsequent explosive activity occurs near Forkill in the form of vents, containing agglomerate consisting mainly of fragments of brecciated granodiorite from the Newry Igneous Complex and Lower Palaeozoic country rock together with large foundered rafts of the older basalt and trachyte lavas. In the main part of the ring dyke the porphyritic felsite pre-dates the porphyritic granophyre and cross-cuts the vent agglomerates. The felsite is restricted to the southwest part of the ring where its outcrop varies in width from 100 m to 1.5 km. Well-developed flow banding in the outer margins of the ring dyke indicates that it is a sheet structure which intrudes a pre-existing ring fracture dipping steeply to the southwest. The porphyritic granophyre forms a more pronounced ring structure and post-dates and intrudes the felsite west of Mullaghbane (P947871). 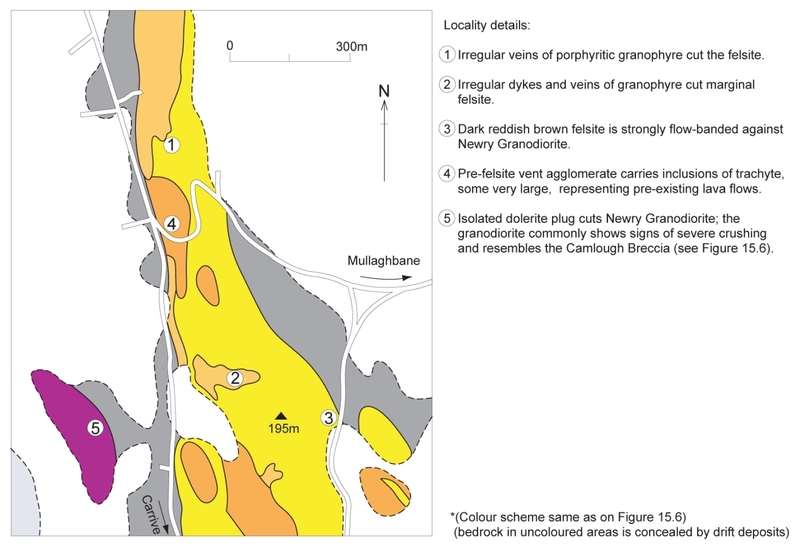 Linear zones of crush brecciation, the Camlough Breccias  affect the Newry Granodiorite, porphyritic granophyre of the ring dyke and post-granophyre aplites in the northwest quadrant of the Slieve Gullion Complex. Cam Lough lies at the northern edge of the complex along a dextral strike-slip fault which displaces the porphyritic granophyre ring dyke horizontally for about 2 km. East of the Camlough Fault the steeply inclined intrusive contact between porphyritic granophyre of the ring dyke and Silurian and Newry Granodiorite country rocks is exposed in Cam Lough quarry (P948038) [J 037 246]. At the centre of Slieve Gullion, the Layered Complex post-dates the ring dyke and consists of at least 13 alternating units of silicic and basic rock. The layered nature of these rocks finds strong topographic expression on the west side of Slieve Gullion, and on Foughill [J 042 181] and Carrickarnan [J 080 181] straddling the Newry-Dundalk road. The Layered Complex was interpreted initially as a succession of rhyolitic and basaltic lava flows, sills, acid tuffs and agglomerates that accumulated on the floor of a caldera . Their subsequent transformation to the present assemblage, which includes rocks with gabbroic and granitic textures, was presumed to be the result of pneumatolytic and hydrothermal alteration during late-stage volcanic activity. 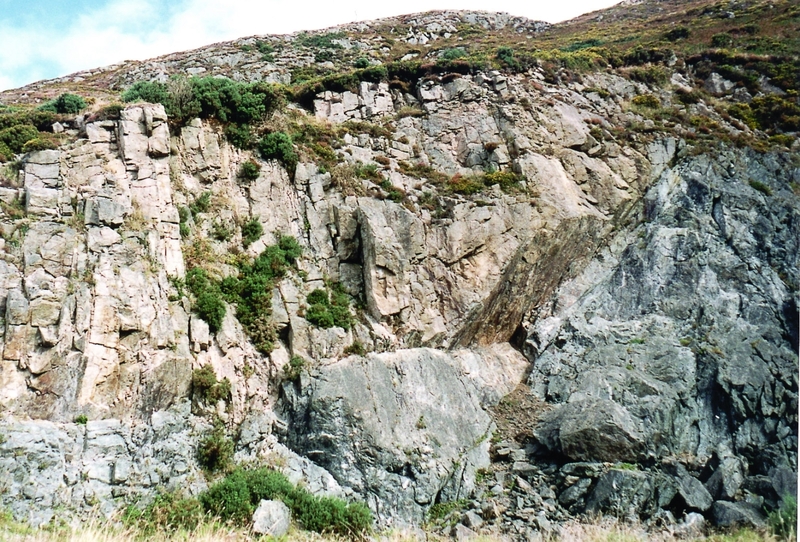 A reinterpretation of these rocks now concludes that they represent a protolith of granodiorite of the late Caledonian Newry Igneous Complex that was altered, first by intrusion of granophyre sheets and then by a more basic magma . This concept supported the fact that not all contacts between the acidic and basic sheets are flat-lying. On the north flank of Slieve Gullion they possess a steep, wall-like relationship and, in the north of the complex, the Lislea Granophyre is regarded as a peripheral ring dyke intrusion continuous with the upper (laccolithic) granophyre layers of the central complex. The final major magmatic event at Slieve Gullion was the intrusion of a granite stock in the southeastern part of the complex. Exposures on Clermont [J 098 171] and Anglesey Mountain [J 104 176] are of greyish green granophyric microgranite with iron-rich clinopyroxene as the dominant mafic mineral. 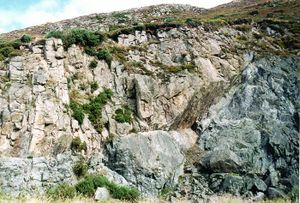 The stock cuts both the porphyritic granophyre of the ring dyke and layers of the sheeted complex but is cut by basaltic cone sheets associated with the Carlingford Complex. ↑ 1.0 1.1 Richey, J E. 1932. The Tertiary Ring Complex of Slieve Gullion (Ireland). Quarterly Journal of the Geological Society of London, 88, 776–849. ↑ Meighan, I G, McCormick, A G, Gibson, D, Gamble, J A, and Graham, I J. 1988. 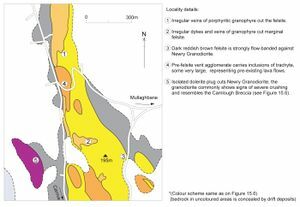 Rb-Sr isotopic determinations and the timing of Tertiary central complex magmatism in NE Ireland. In: Morton, A C, and Parson, L M (eds.). Early Tertiary volcanism and the opening of the NE Atlantic. Geological Society Special Publication No 39, 349–60. ↑ Gamble, J A, Wysoczanski, R J, and Meighan, I G. 1999. Constraints on the age of the British Tertiary Volcanic Province from ion microprobe U-Pb (SHRIMP) ages for acid igneous rocks from Northern Ireland. Journal of the Geological Society, London, 156, 291–99. ↑ 4.0 4.1 Emeleus, C H, and Preston, J. 1969. 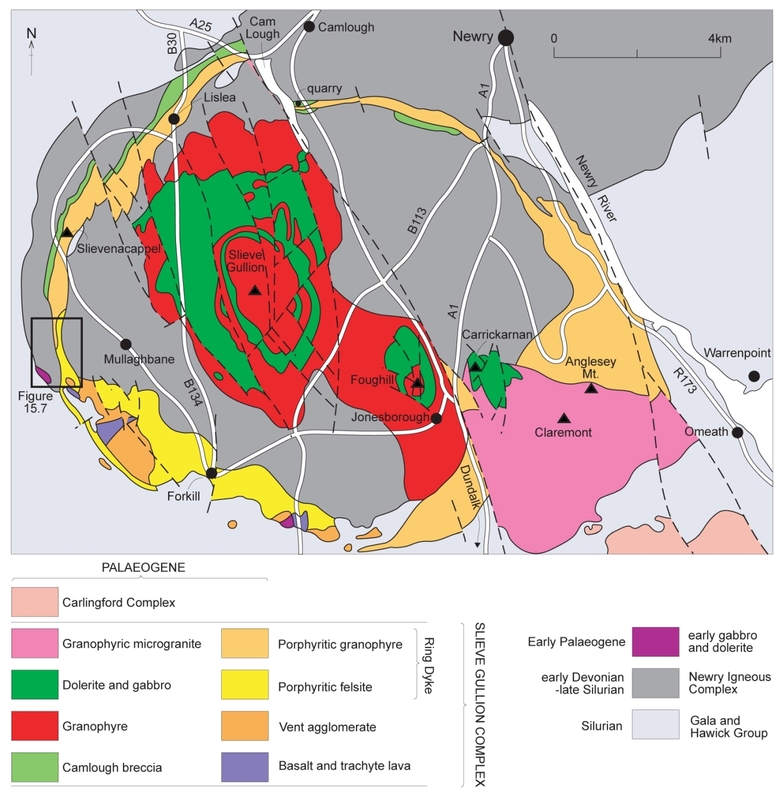 Field Excursion Guide: The Tertiary Volcanic Rocks of Ireland. Belfast. ↑ Reynolds, D L. 1951. 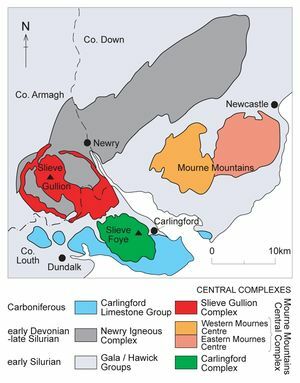 The geology of Slieve Gullion, Foughill, and Carrickarnan: an actualistic interpretation of a Tertiary gabbro-granophyre complex. Transactions of the Royal Society of Edinburgh, 62, 85–143. ↑ Bailey, E B, and McCallien, W J. 1956. Composite minor intrusions and the Slieve Gullion Complex, Ireland. Liverpool & Manchester Geological Journal, 1, 466–501.